BLACK HISTORY SPOTLIGHT : RUBY BRIDGES! 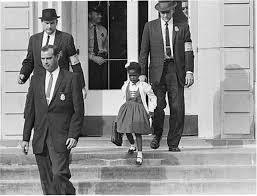 On September 8, 1954, Ruby Nell Bridges was born in Tylertown, Mississippi, to parents Lucille and Abon Bridges. At the age of four, her family would move to New Orleans, Louisiana. When Ruby was six, her parents accepted a request by the N.A.A.C.P to allow Ruby to participate in a program to integrate New Orleans schools. On November 14 1960, despite massive southern white racist backlash, Ruby Bridges would integrate William Frantz Elementary school. At the age of six, she would become the public face of desegregation in New Orleans, Louisiana.